I made it to the Santa Fe Farmer’s Market on Saturday – hooray! I picked up a great haul; poblano peppers, shishito peppers, okra, kale, napa cabbage, Golden Supreme apples, Green Zebra tomatoes, Penasco Blue garlic and Cranberry Red potatoes. And I have figured out what I am doing with everything except the kale. I want to try a raw kale salad but I haven’t had the courage to jump right in there yet. I know that Ricki over at Diet, Dessert and Dogs is just about the queen of raw kale salads but so many of them have special ingredients that I don’t keep in my house, like stevia and such. Does anyone have any suggestions for a yummy, simple, first-timer, raw, kale salad? Since I made it to the market, it threw off our meal plan from last week a little bit. We did not get to the Lasagna or Tortilla Soup. Instead, last night we ate Quinoa Stuffed Poblanos (recipe to come!) and tonight we had some frozen homemade tamales with sautéed shishito peppers! Both the lasagna and soup are easily made from pantry staples and few fresh ingredients, so I typically save those dishes until the end of my meal planning week anyway, just in case I don’t get to them, as it happened this week. I had also planned a lot more meals than usual last week, six meals instead of my usual four. So this week, I am getting back on track and only planning five meals! And before I forget, this week’s theme at the Gluten Free Menu Swap is Brussels Sprouts! We love Brussels Sprouts! I did not see any at the farmer’s market yet but I know I can get some at the store so I added them to our menu this week. Our favorite way to eat them is roasted with a little olive oil and salt and then drizzled with balsamic vinegar when they come out of the oven. Or sprinkled with a little Parmesan cheese. And to think that two years ago I had never eaten a Brussels Sprout! 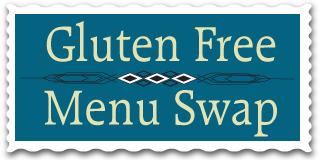 This week’s host for the Swap is Celiacs in the House, so go on over and see what everyone is up to! Creamy Pesto Pasta with Chunky Tomato Salsa – I need to work on my basil plant, before the frost hits! More frozen basil cubes are probably in my future too! As for our sweet treat for the week, I am trying to decide which flavor of ice cream to make. This past week I made Simply Sugar and Gluten Free’s Coconut Chai Spice Ice Cream. It was tasty, although my husband and I aren’t sure we really like coconut milk ice creams. I suppose if we couldn’t have dairy, we’d probably love these ice creams. But we can and so far we’ve found them to be a bit too coconuty for us. So a dairy-filled treat for us this week it is. Either Chocolate Chip Salted Butter Caramel Ice Cream or Nutella Ice Cream. Decisions, decisions, huh?! This meal plan is also cross-posted over at OrgJunkie. Check it out for a ton of menu ideas, some gluten free, some vegetarian, and some not! You’ve reminded me to go rescue that basil before the frost gets it. I have to agree with the coconut ice cream. It’s good, but since I can have dairy, not good enough. I love the idea of topping the roasted Brussels sprouts with balsamic vinegar. That sounds wonderful. The maple roasted sprouts was very tasty, but slightly overcooked. I’ll have to adjust it next time. Yes, we love vinegar here at our house and balsamic tastes great on just about anything! :-) Last week I roasted our sprouts with maple syrup but they were a bit too sweet for me, although still tasty. Kids would probably eat them this way… But apparently I like savory Brussels sprouts! I saw sprouts for the first time today at the farmer’s market and I was tempted but I had plenty of other goodies already in my bag. Next time! Check out my blog at http://gfinaz.blogspot.com/search/label/kale for a simple kale salad I made recently, as well as kale I’ve cooked. It’s simple to make and you can just massage it with olive oil and lemon juice and just add anything you want to the salad. Yum. What is a shishito pepper? I’m gonna’ have to look that one up. Thanks Valerie for the suggestion. I am going to have to buy some again and try it raw. The shishito peppers are wonderful, you can probably find them at the farmer’s markets. So simple to make and tasty to boot. I am going to try and grow some next year. Good thing I’m vegan or you’d find your chocolate chip salted butter caramel ice cream (has a better string of words EVER existed??) disappearing before you knew what hit you! Thanks for the kale suggestions. One day I will try it!!! I was a bad girl and let the kale go to long and so the dogs and chickens enjoyed it instead. Oops!